Many of the current security and monitoring systems available till now requires manual intervention and not all of them real time and don’t support 24 hour monitoring. Where the manual intervention is, there will be little pinch for errors. The GSM based Automation system provides easy accessibility and complete automation of the system. 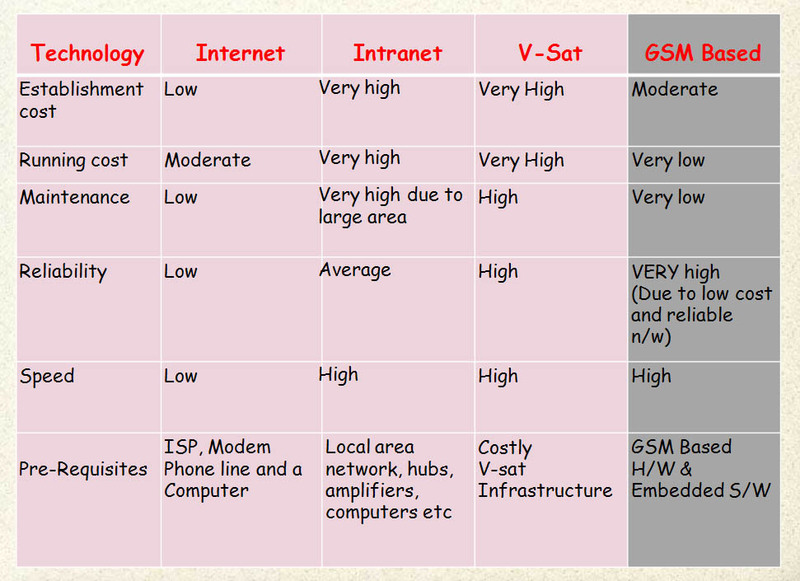 The mobile network is on the path of continual improvement. The betterment of this system for the end user is the main aim of the project. As the mobile has become an integral part of our lives, the choice of this project seems all the more logical. Automated system with GSM module is an effort to satisfy these events. 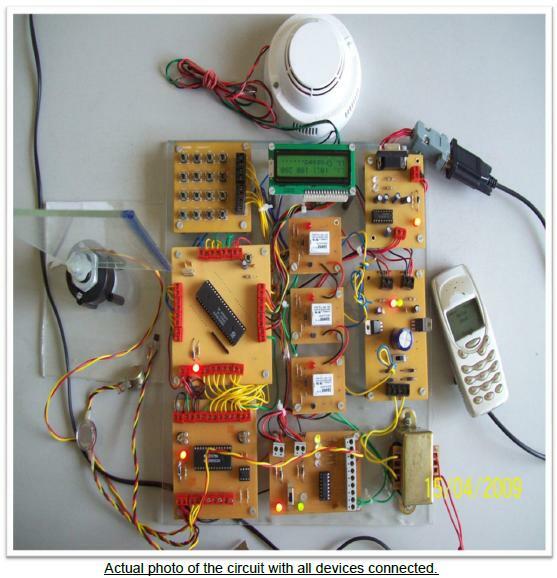 Fire sensor: In this project we have used ionization type smoke detector which will continuously check for fire in the place of its installation. Temperature control: In this project we have used LM35 as temperature sensor which will continuously check the temperature and give its output to micro-controller through ADC. Two relays will switch the heater and the cooler respectively according to temperature preset. Anti theft device: In this project we have used keypad based locking system, where in the user has to enter the pre-defined password to open the door. User gets 3 attempts to enter correct password. Light control: In this project we have used LDR (light dependent resistor) to control the lighting of the room based on the intensity. Lights will switch ON-OFF according to some predefined intensity level. For GSM module we are using Nokia 3310 with an F-bus cable and it serves the purpose of GSM interface with microcontroller. For purpose of display we are using 16*2 LCD display which gives information about various activities happening in the microcontroller and peripheral devices. 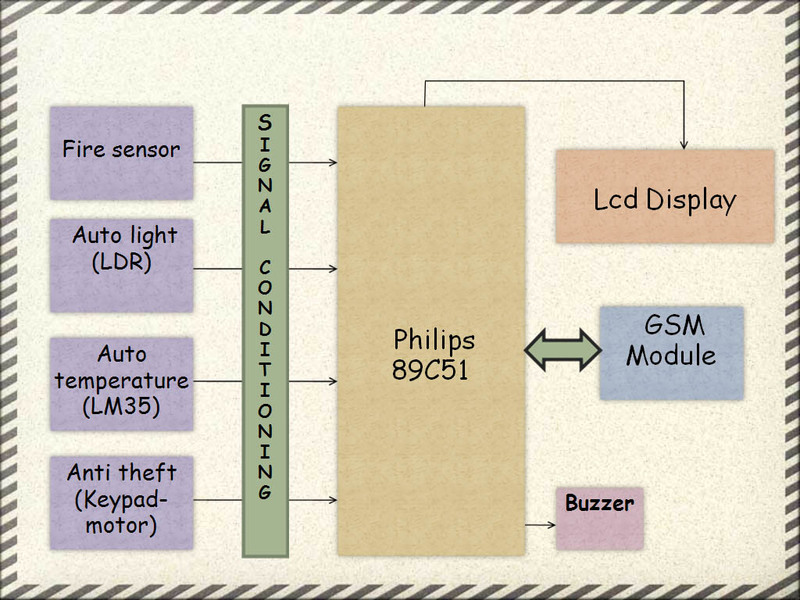 Micro-controller used here is Philips P89C51. Buzzer is used to bring to attention some undesirable event that is going to take place. components. 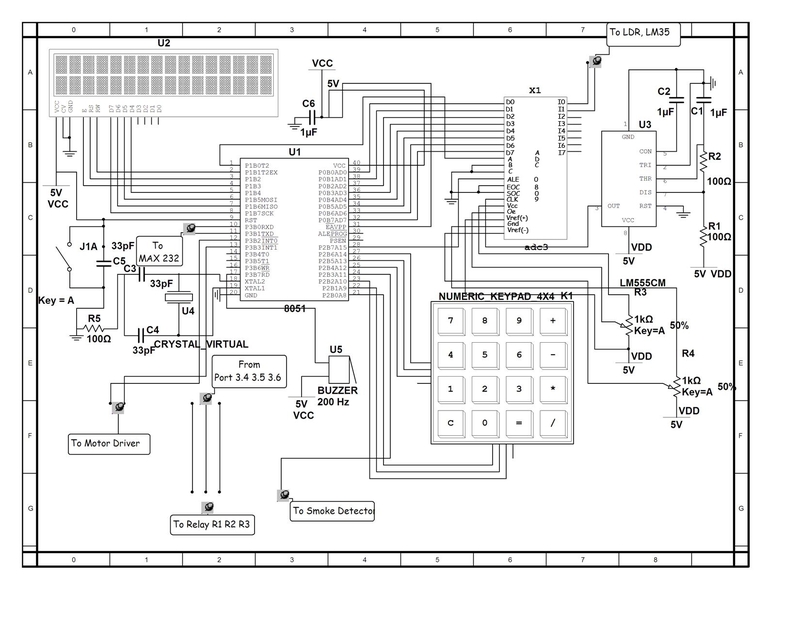 The components which are interfaced are LCD, ADC, Keypad, Relays, Smoke sensor, LM35. LCD: The LCD is connected to the Port 1 of the microcontroller. The pins P1.5 to P1.8 are the data lines. P1.2 to P1.4 are control lines. P1.2 is connected to WR (write) pin, P1.3 is connected to RD (read) pin and P1.4 to enable pin. ADC: ADC is used to convert the input analog signal to digital signal. It is connected to the Port 0 of the microcontroller. The ADC gets the analog signal from the temperature sensor and LDR. Timer is used to provide clock pulses to ADC used in the conversion of analog signals to digital signals. Keypad: Keypad is a component useful in the Anti Theft system. It is connected to the Port 2 of the microcontroller. The user uses keypad to enter the password. The user must enter the correct password in order to enter the house. The keypad used here is 3*3 keypad. Smoke detector: Smoke detector used is an ionization type detector. It is connected to port 2.3 of microcontroller. LM 35: It is temperature sensor used to constantly monitor temperature inside the room. It is connected to channel 2 of ADC 0809. LDR: it is used for automatic light controlling and continuously senses for change in light intensity. It is connected to channel 1 of ADC. The system we have designed works as a real time system which keeping on scanning the current condition with the one which is preset in the micro-controller to check if there is any undesirable condition. If there is any undesirable condition it takes corrective action accordingly for e.g. if the temperature passes the set range of 20-40 and it goes down to say 18 in this case we have predefined to turn ON the cooler till temperature becomes greater than or equal to 20 i.e. bringing it back to pre defined range. Similarly we have done it for automatic lighting where if the intensity of light falls below dome predefined range the micro-controller switches on the relay and hence the light thus compensating for fall in intensity of light. We have used a smoke sensor to continuously monitor if the house is safe from any fire hazardous. The sensor used is an ionic type sensor whose working is explained in detail in section 3.13. The sensor checks for hazardous condition and immediately brings it to notice of the owner if there is any breakthrough. Similar sort of arrangement is made for security by using keypad based locking of the door which acts as burglar alarm system. Only genuine user can enter the room who has the correct password. The user gets 3 attempts to enter correct password if he fails to enter it correctly the buzzer starts to ring and immediately this is brought to notice of the owner by sending him a warning message. This is how the entire system works. For more details download the PDF (BLACK BOOK) and zip of PCB LAYOUTS for more circuit details. The Programming part is included in Software zip. Programming is easy on PHILIPS 89C51 as it has (In System Programmable (ISP) with a boot loader. Details can be seen in datasheet. Program is written in Embedded C and is well commented so you can make necessary changes and it can be reused as per need. Folder doesn’t contains hex file, it can be made using Keil Compiler. Make your own and use it :).